A neuroma is a benign (non-cancerous) growth of nerve tissue frequently found in the forefoot (front part of the foot, including toes) between the 3rd and 4th toes, counting from your big toe. A neuroma is also referred to as a “pinched nerve”. Normally, there are no lumps or other outward signs. Although the exact cause is unclear, a number of factors can contribute to the formation of a neuroma including deformities (e.g. a high-arched or a flat foot), trauma (which can cause damage to the nerve resulting in inflammation or swelling), and improper footwear (which causes the toes to be squeezed together). Forefoot neuromas are more common in women than in men. A neuroma brings on pain (often described as like having a stone stuck in your shoe), a burning sensation, tingling, or numbness between the toes and in the ball of the foot. Those suffering from a neuroma, while walking, often find temporary relief by stopping, taking off the shoe, and rubbing the affected area. Surgery removes the inflamed nerve, involving identifying the nerve and resecting (cutting) the neuroma. After surgical removal of the neuroma and the injured nerve, the space between the two toes is expected to be numb. 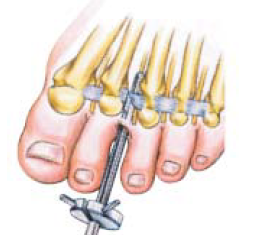 This can be done through an incision on the top (dorsal incision) or on the sole of the foot (plantar incision). You will have a bandage or dressing to protect the incision. You will be instructed on caring for your dressings, and if and how much weight you can bear on the foot. Keep your dressings dry (place a plastic bag on your foot when showering). Watch for complications. Alert your surgeon or visit an emergency room if you experience bleeding that won’t stop, pain that does not subside with prescribed medication, swelling that worsens (or dressings that become too tight – remove them, but visit an emergency room immediately following) after the second day, drainage from the wound, and/or have a fever higher than 38°C or 101°F. About 10 to 14 days after surgery, the dressing and sutures will be removed at a post-operative appointment determined by your surgeon, and you can participate in some exercise programs. In general, pleasure walking, swimming, using an elliptical and stationary biking are acceptable. Sports like tennis or running and other exercises that place a large amount of pressure on the toes, or involve sudden stops, are not advised for at least 6 to 9 months. You will be able to wear a stiff-soled sandal or shoe 6 to 8 weeks following surgery, but swelling may take up to 12 months to completely subside. Any and all information will be kept confidential.